Every Hydrafab pressure vessel is designed, fabricated, inspected, tested and certified to the standards and requirements outlined in accordance to ASME Section VIII Div. 1. Our pipe spools utilize a superior process by implementing the latest welding technology, rotators and manipulators. Our Custom Modular Fabrication solutions can reduce field man-hours and schedule overruns. Insight is a real-time interactive simulator enabling live walk-through's, real-time interaction, and experience-driven design for engineering projects. We provide photorealsitic renderings and technical animations that can bring your project to life for comprehensive understanding of your product & processes. Hydrafab produces excellent products through innovation and high standards integral to our process. We are committed to providing a safe and rewarding work environment, and continue to improve our safety record year after year through training and continuous education. Hydrafab follows strict Quality Assurance and Quality Control standards for every project. We utilize industry standard practices, and follow comprehensive guidelines regarding inspection, documentation and procedures. Hydrafab's conceptual design capabilities align each projects function, scope, cost and schedule with client objectives for project success. From decades of experience, our technical professionals develop innovative design solutions. We believe our employees are our greatest assets, and our team aims to produce industry-leading products and services. Our commitment to quality and customer satisfaction is at the core of all we do from planning to final product. The Hydrafab Services & Capabilities animation details the process, management and engineering approach we utilize for all of our projects to ensure our quality standards are met. The virtual tour is a photo-realistic immersive and interactive 360° view of a Hydrafab custom engineered production facility that highlights our equipment and processes. Click below to get started. The interactive models show our custom engineered modular fabrication equipment that we integrate into our production facilities and describes the function and operation of each model. Click below to get started. 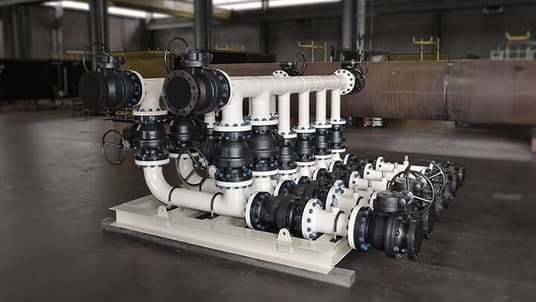 Our modular fabrication process has proven to be an effective and efficient alternative to field installation by reducing costs while increasing quality. Below are a few benefits Hydrafab can offer through our unique modular design and in-house fabrication process. Hydrafab's modular design process decreases onsite construction and assembly time, thereby avoiding time and costly overruns to keep your project on schedule and on budget. By using our efficient and ever-improving modular design, we can decrease field construction cost by up to 50%. Our controlled environment lets us focus on safety and quality, as well as keeping total production days to a minimum. This allows our clients to avoid production delays caused by weather events, skilled labor shortages, or logistic issues which are affecting todays project schedule constraints more and more. Hydrafab is dedicated to improving quality assurance throughout our process. Our team of dedicated quality professionals ensure compliance to ISO 9001:2015. Hydrafab has decided to seek accreditation for ISO 3834 part II, which is specifically for quality assurance of fabrication. This accreditation is highly sought after by international EPC’s including Bechtel, BHP Billiton, Fluor and John Holland, as a means of selecting world class fabricators.